Thanks to its collaboration with BRC Compressors, Tecnogas designs and realizes several types of CNG autogas filling stations for cars and industrial fleets. 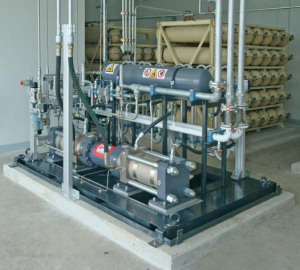 Our range includes a wide choice of customized solutions with different kinds of compressors. Our plants offer the best performances in safety, efficiency, reliability and easy maintenance and guarantee low noise levels, reduced dimensions and reasonable operating costs. Tecnogas also handles the ordinary and extraordinary maintenance service of the filling stations. Connected to the natural gas pipeline, the Mother Station is thought for the filling of the cylinder wagons. 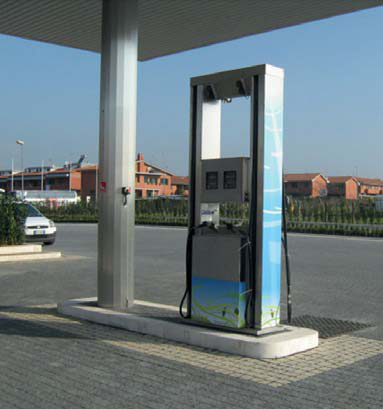 If provided with a dispenser, the filling of vehicles is also possible. 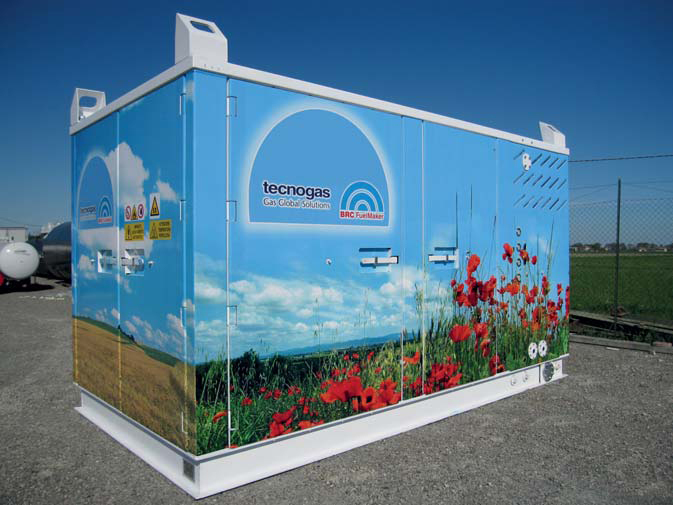 This system allows to supply CNG also in the most distant areas where there are no pipelines. The compressed gas is brought to the final customer (filling stations, small communities, industrial fleets, etc.) 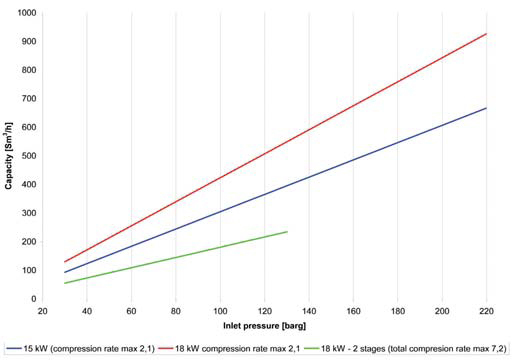 and then de-compressed at its working pressure. The Daughter Station is the solution usually adopted in all those places where there is no pipeline. The natural gas gets to the station through the cylinder wagons filled at the Mother Station. 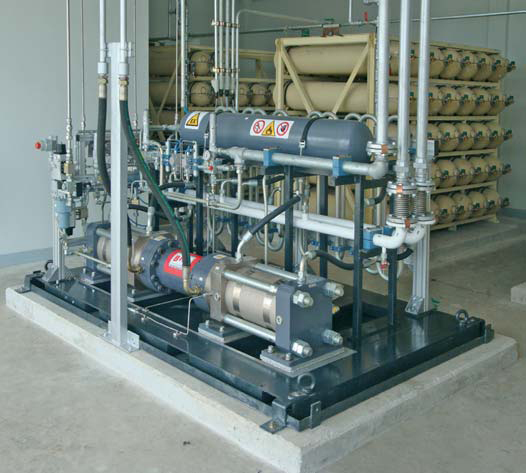 The base installation consists of 2 lines directly connected to the dispenser, one coming from the cylinder wagon and the other one from the hydraulic compressor, which is usually installed in these stations, with a small damping rate. These systems have an emptying capacity of the wagons which can reach 25 bar. 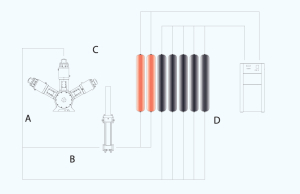 Taurus is a W-shaped reciprocating kinematic compressor composed by crankshaft, connecting rod, crosshead, rod and piston. 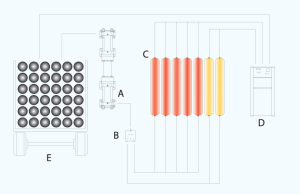 The gas is compressed in three different stages inside three cylinders placed 60° one from the other. Some concentric valves with plastic seals guarantee the CNG suction and discharge operations. 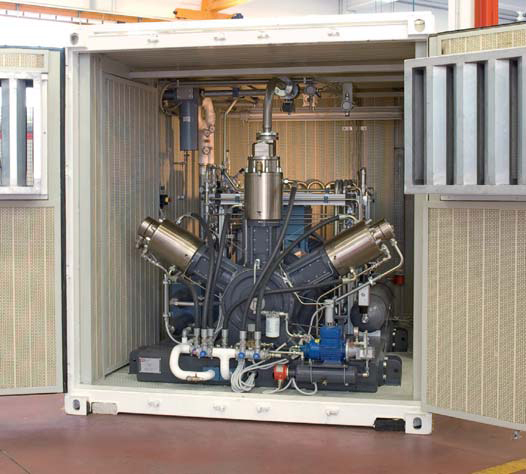 Each compression stage is water cooled through a closed internal pressure circuit and the gas is refrigerated at his outlet by some gas-water exchangers. 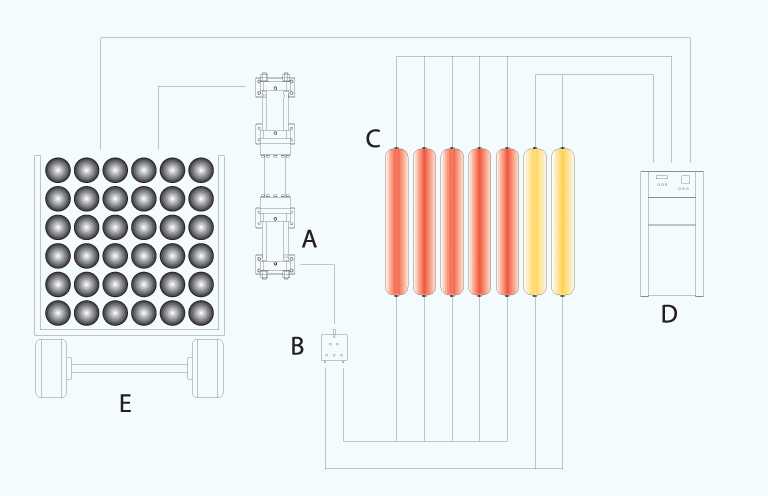 The lubricating system too is cooled by the same liquid. 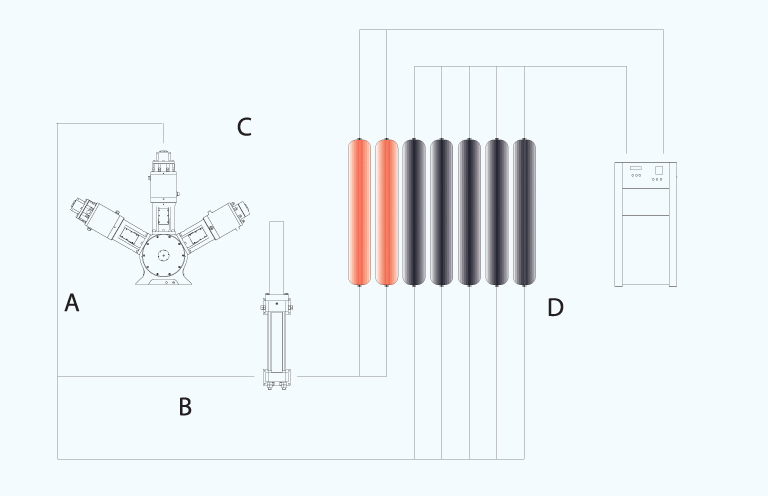 The hydraulic compressor uses the hydraulic drive to move one or more pistons in order to compress the natural gas. 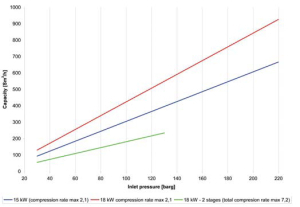 The compression system with integrated booster is usually composed of a W-shaped reciprocating 3-stage single-acting compressor, a two-level storage, a double-acting single stage booster and a pressure control system. 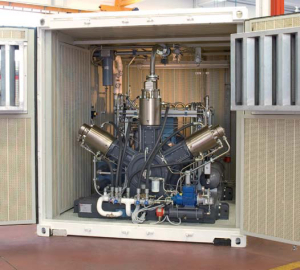 The booster reduces the absorbed power by the main compressor and the number of starts. 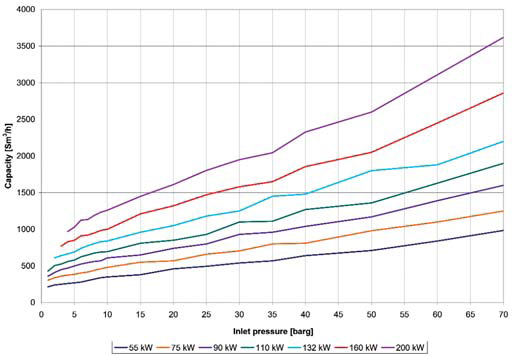 As a consequence, the power consumption and the mechanical stresses to the plant are very low. 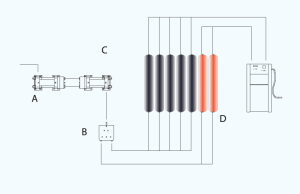 The booster is able to distribute the compressed gas at high pressure in every moment and guarantees the car filling at the maximum pressure. 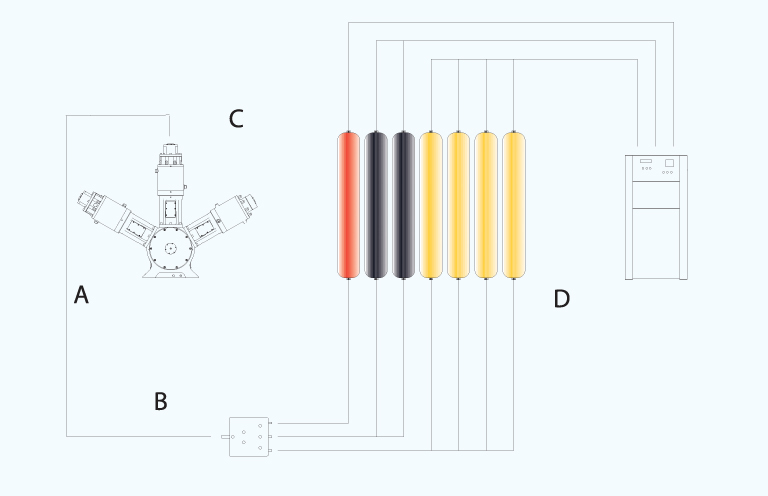 The storage is simplified and reduced since the control board, the third cylinder level and two of the three safety systems are not necessary. Other advantages are related to the precision during the filling and to the possibility to compensate the insufficiency of the main compressor during the rush hour. This represents the ideal solution for the filling of the fleets composed by many big vehicles. 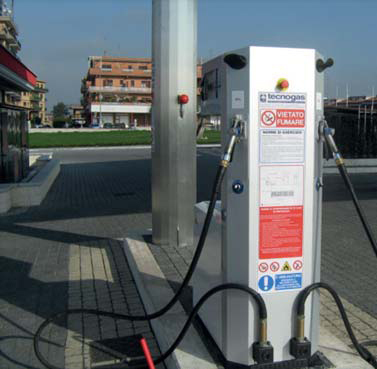 In this case CNG is compressed and stored in cylinder packs and distributed to the vehicles through a dispenser. 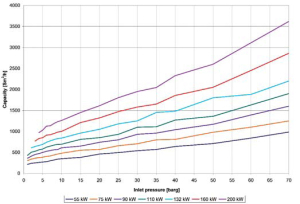 The capacity and the storage levels are sized according to the customer’s needs. 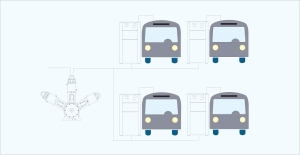 This layout is generally adopted when there is no need for a fast filling of the fleet vehicles and the information about the quantity of CNG distributed for each vehicle is not requested. This system doesn’t require the storage unit since the filling is made contemporarily to more vehicles. This kind of station is normally the cheapest but it requires a wide parking area equipped with several filling points. These stations work with the same concept than the Slow or Fast Filling Stations but in this case the vehicles are filled according to their order of arrival. 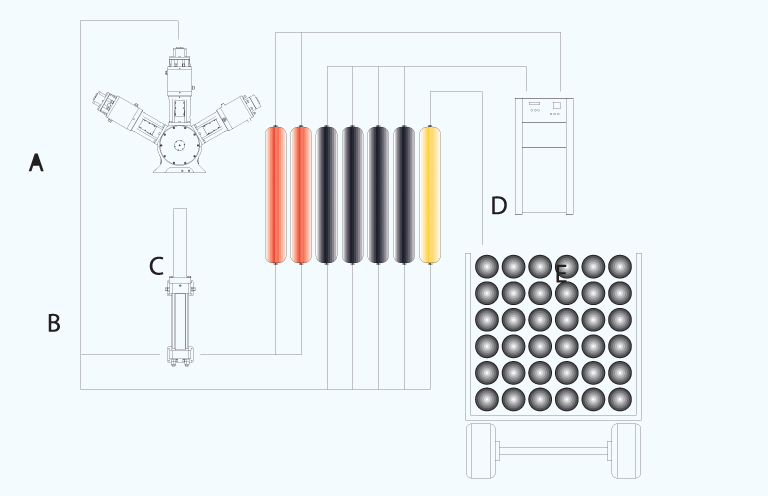 An automatic control system manages the filling. This system is mainly used for the bus or taxi fleets which carry out the filling during the night. 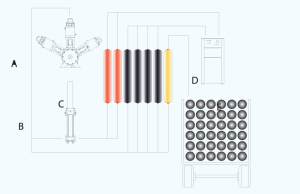 Usually the plant is provided with some filling points with 5-6 nozzles. When a vehicle connects, it automatically generates a reservation due to which it is also possible to record the quantity of CNG distributed.